In 1643, King Charles’s Royalist Army lays siege to the city of Gloucester. 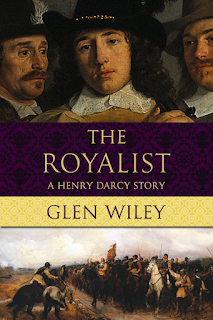 Sixteen-year-old Henry Elder sneaks into the king’s camp as a spy for the Parliamentarians, but when discovered he pretends to be the son of a Royalist colonel, who unfortunately happens to be dead. Henry has no choice but to keep up the ruse when King Charles orders him to Oxford. On the eve of his departure, Henry’s adoptive father reveals a life-changing secret: Henry’s biological father is Hugh Darcy, a nobleman forced to flee England to escape Royalist persecution. And now, with Henry off to join the Royalist cavalry, he has the chance to spy on and bring down the very people who destroyed his family. But even more secrets are revealed. Henry’s father hid a small fortune for the son he left behind, and Henry’s not the only one looking for it. After arriving in Oxford Henry falls in love with Elizabeth Hamilton, and even though her parents forbid them to see each other, they continue to do so in secret. As the war rages on Henry maneuvers between hostile armies, dubious alliances, and deep religious schisms, he finds his loyalties divided between the Royalists and Parliamentarians; between his grudging respect for Oliver Cromwell and his admiration for Prince Rupert; and between the woman he loves and his ambition to recover his father’s estate. Henry ultimately has to question his own beliefs, desires, and motivations, and finds that he doesn’t always like what he discovers. 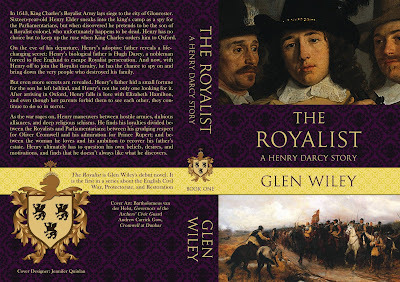 The Royalist is available now in ebook and print format on Amazon! Check out Glen's website for more info!